Yu-Gi-Oh! 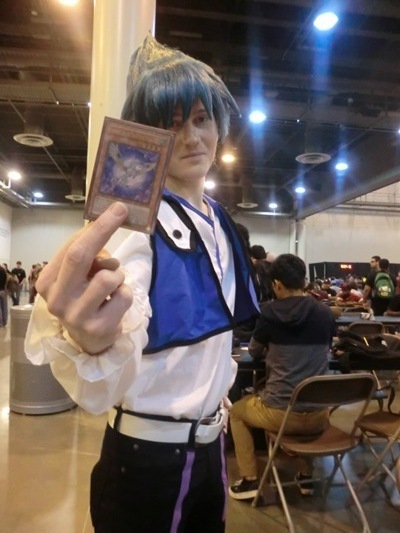 TCG Event Coverage » YCS Houston First-Timers! 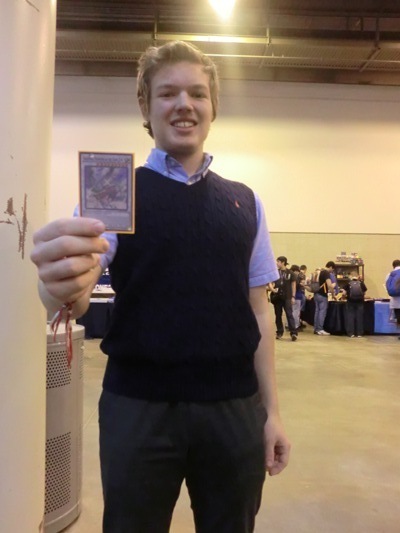 Home > 2016/04 - Houston, Texas, Yu-Gi-Oh! Championship Series	> YCS Houston First-Timers! The room is filled with experienced Duelists, but not everyone here is a Yu-Gi-Oh! veteran. There are lots of players who will be competing in their first YCS event this weekend! 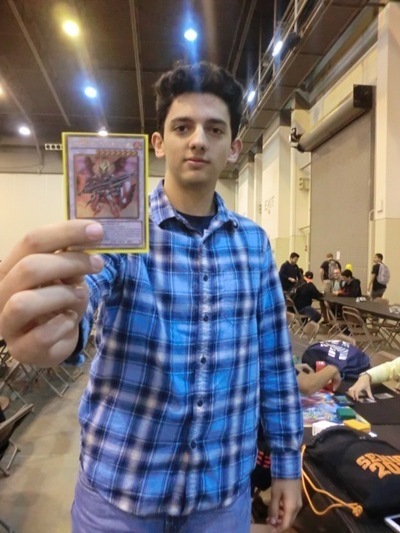 17-year-old Sam Robedee from Houston, for example, is entering his first ever YCS this weekend using his Yang Zing Deck. Robedee likes that his monsters can replace themselves with new monsters, and join together to form bigger monsters through Synchro Summons. Robedee says the turnout this weekend is bigger than he expected, and he’s excited to Duel against the best. Take a look at Sam holding up one of his favorite Synchro Monsters, Chaofeng, Phantom of the Yang Zing! 18-year-old Jason Myers is also a Houston local. He’s using a Magical Explosion Deck in today’s tournament. When I asked him for his impressions of the tournament, here’s how he responded: “It’s cool and amazing, and I couldn’t help but smile when I got here. It’s Yu-Gi-Oh! on a bigger scale than I’ve been to previously. There are lots of opponents to Duel and lots of cool cards to look at.” Check out Jason holding up his Magical Explosion! 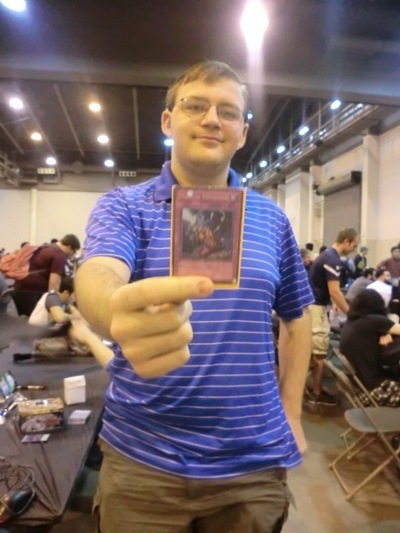 Joseph Mothershead from Livingston, Texas isn’t exactly new to the YCS scene, since he once competed in the Yu-Gi-Oh! Championship Series event in Austin. But this time, he’s here as Duel Academy star Jesse Anderson from Yu-Gi-Oh! GX. 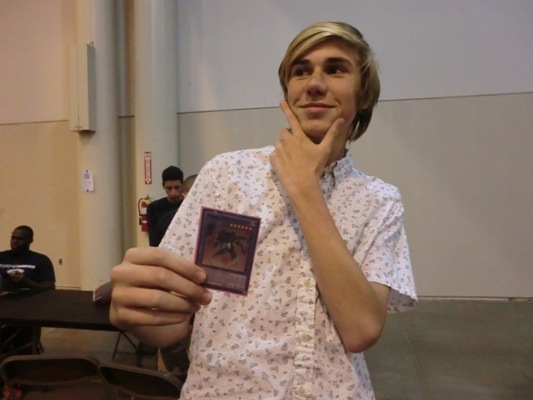 Joseph is using a Monarch Deck in the tournament, but has a Crystal Beast Deck with him to use in more casual Matches. Four of our other YCS first-timers are all local Duelists who traveled here together, and they’re all using different Decks! 17-year-old Darien Church from San Antonio, Texas is the third member of the group that traveled here together. Church is using a Monarch Deck in the tournament this weekend. “There’s a lot of people here,” he told me. “It’s a little intimidating, but I’m really excited.” Take a look at Darien holding up his Majesty’s Fiend! 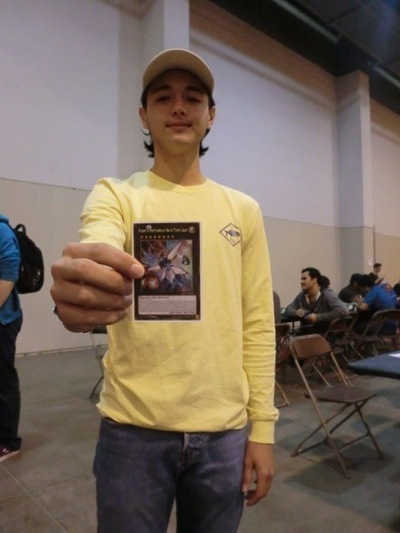 Finally, 18-year-old Austin Spier from New Braunfels, Texas is the last Duelist in the group of four first-timers that drove here together. When I asked Austin about his impressions of the event, he answered, “It’s pretty intense. There’s a lot of people here. 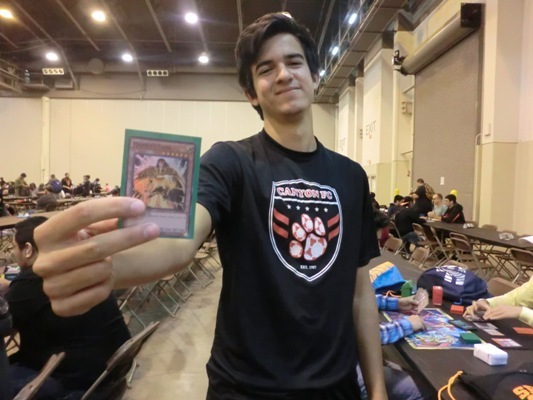 It’s a lot bigger than the San Antonio Regional I was at last weekend, so it’s gonna be tough.” Austin is using a Performapal Pendulum Deck with Draco monsters in it. His Extra Deck features Number 38: Hope Harbinger Dragon Titanic Galaxy from the new Premium Gold: Infinite Gold. How will our YCS First-Timers fare in this weekend’s event? Follow the coverage to find out! Round 1 Feature Match: Kyle Fisher versus Dwight Mccombe Welcome to YCS Houston, Texas!